Mount Prospect Therapist: Home Psych Services, P.C. - Therapist 60056. Home Psych Services, P.C. is a unique behavioral healthcare practice that has resurrected the lost art of the "house call." We bring the clinic to you. We are a natural add-on service for those clients already using Home Health Care Agencies. Contact Home Psych Services, P.C. Send A Message To Home Psych Services, P.C.. Session Fees: Our usual and customary fee is $160 for a 50-minute home visit. Sliding scale fees are available upon request and based on client need and ability to pay. Dr. Mark Parisi is Licensed as a Clinical Psychologist In Illinois and Florida. He earned his Master of Arts (M.A.) in Clinical Psychology from Roosevelt University in Chicago in 1991. Dr. Parisi went on to earn a Master of Science (M.S.) in Industrial/Organizational (I/O) Psychology and his Doctor of Psychology (Psy.D.) Degree in Clinical Psychology from Florida Institute of Technology In 1995. He is also certified as a Professional Mediator through the Association of Conflict Resolution Institute. Dr. Parisi finished his internship and residency while serving on active duty in the U.S. Army from 1995 - 1998 and specialized in Child and Adolescent Psychology, Community Mental Health, and Traumatic Stress Disorders. He deployed overseas to the Sinai Peninsula, Egypt, in 1997 with the 10th Mountain Division of the U.S. Army as part of Task Force 2-87. He was awarded the Meritorious Service Medal (MSM) for his active duty military service in 1998. Dr. Parisi has worked post-residency since 1998 and opened his practice in the Chicagoland area back in 2000. He has served as a consultant to schools and businesses on a wide variety of mental health topics. As a child psychologist, Dr. Parisi has worked as a child advocate, as a consultant for Head Start, and as a pediatric evaluation and treatment expert. He has highly specialized training in disruptive behavior disorders of childhood under Drs. Russell Barkley and Robert Brooks. At his clinic, Dr. Parisi maintains a broad-based practice serving children as young as three years old and adults well into their golden years. He provides individual, group, family, and couples' therapy utilizing a Cognitive-Behavioral / Solution-Focused treatment style. In his work as an I/O Psychologist, Dr. Parisi has performed personnel selection and job analysis for both military and civilian agencies. In addition to his work as child psychologist, Dr. Parisi has a sub-specialty in geriatrics and has worked tirelessly as a champion for mental health issues among the elderly and chronic mentally ill. He serves as a consultant to several area nursing homes and long term care facilities and designs state-of-the-art programs tailored to the unique needs of skilled nursing facilities around Metro Chicagoland. Dr. Parisi co-founded Home Psych Services, P.C. in 2011. 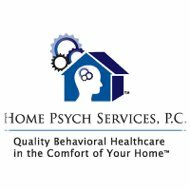 Home Psych Services, P.C. is a unique behavioral healthcare practice that offers the full spectrum of behavioral healthcare services including social work, psychological testing, and psychiatric medication management in the comfort, safety, and convenience of clients' homes. Dr. Parisi grew up in Park Ridge. He is married and lives with his family in Skokie where he enjoys family time, attending movies and plays, reading, hiking, and running. Dr. Parisi is a member of the American Psychological Association and the Skokie Valley Rotary Club. He presently serves as a Lieutenant Commander in the Medical Service Corps of the U.S. Naval Reserves and is a veteran of the U.S. Army's 101st Airborne Division.